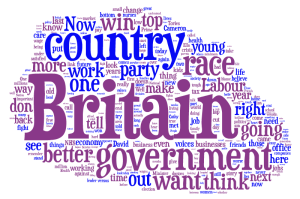 Well, the autumn 2013 party conferences have now come to an end, and below are the three main party leader speeches, by tag cloud. Note that all three have had the word “People” removed, as that was skewing all three speeches. Hover over for which party each cloud belongs to. 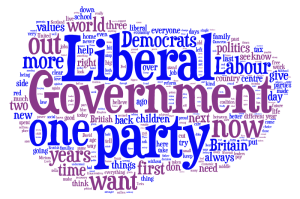 Lib Dem conference leader’s speech was the least effective. 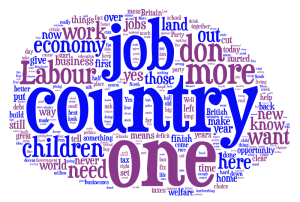 Jobs – where did that pledge disappear to? Yes, people want their kids to have a free school meal, but they’d rather have jobs and somewhere to live. And only a big increase in supply of housing will prevent the 2017/18 recession as interest rates bite again. I’m guessing you didn’t listen to the actual speeches then, or attend conference – the jobs campaign was a huge part of it and was the theme behind the rally: http://www.bbc.co.uk/news/uk-politics-24081192. One million more jobs created, and 1 million more apprentices. Housing is also important, and the policy paper is at http://www.libdems.org.uk/housing.aspx. I’m just looking at the ‘cloud’ and taking as much interest as Joe Public.